Having watched a few games of the Prime Minister’s Cup at Dasarath Rangasala, I noticed that the sophistication level of fans has risen quite dramatically from years past. Before there would be just a lot of “halla” at the stadium and the average fans had little respect for the nuances of the game. A goal against would be instantly blamed on the helpless Goalkeeper and a passback to a defender would confirm the weakness of a midfielder. Perhaps because of the wide availability of European football matches on television, in particular the English Premier League, Nepali football fans seem to have grown-up. They now clap when players make good plays. There is sarcastic applause when the opponents make an error. Chanting begins when the home team needs a bit of a lift. It's not perfect however (nor is it anywhere in the world), as I recalled jeers when Nepali players took the ball to the corner flag to waste time as they were leading 1 - 0 near the end of the Nepal Red - Pakistan match, something that is advocated by most coaches. 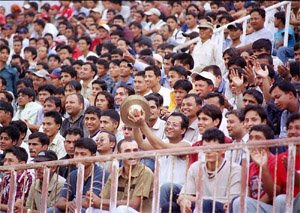 But certainly Nepali fans' sense of the game is much different than it was few years back.